Thursday, 20 Jun 2019 at 7:30 PM . The Members were one of the most imaginative guitar bands to emerge in the aftermath of the 1977 punk explosion. Their massive top ten hit 'The Sound of the Suburbs', was produced by Steve Lillywhite and reached #12 in the UK charts along with a memorable appearance on BBC1's 'Top of the Pops'. Follow up single "Offshore Banking Business" showed the band's love of Reggae. Their first LP, 'Live at the Chelsea Nightclub', released in 1979, was listed as one of the top 20 punk albums by Record Collector Magazine. The second album "1980 - The Choice is Yours" cemented their place in the UK's new wave scene. 1982's "Going West" LP featured a reggae version of Kraftwerk's "The Model", but was to be the band's last before they split. Piranhas 4+ is the latest incarnation of The Piranhas, who originally formed around 1977 in Brighton. 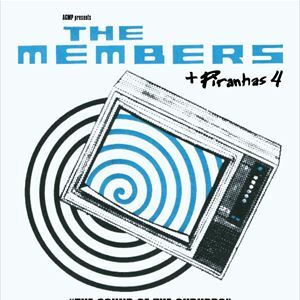 The Piranhas first came to prominence when John Peel started playing their single "I Don't Want My Body" on his BBC Radio 1 show. Their biggest hit was a cover of the Elias and his Zig Zag Flutes song "Tom Hark" which reached the UK Top 10 in 1980. The band released a sole, eponymously titled album the same year and had one more UK top 20 hit, another cover, this time Lou Busch's "Zambesi" in 1982 before splitting the following year. Back together with a 6 piece line up, Piranhas 4+ are appearing in London for this date exclusively.